Russia has banned transsexuals from driving as part of a crackdown on those who supposedly pose a threat to road safety. Cross-dressing and asexuality are among a range of conditions and behaviours that the government says could hinder driving ability. The long list includes those deemed to have sexual or “mental disorders”, such as fetishism, voyeurism and exhibitionism, as well as gambling addiction, pyromania and kleptomania. Human rights activists have condemned the rules as an another assault on Russia’s gay, bisexual and transgender community. The rules have been set out in an order signed by Dmitry Medvedev, the prime minister. Some of medical conditions on the list are ones that the World Health Organisation identifies as “gender identity” and “sexual preference” disorders. The government said that the measure was designed to reduce Russia’s horrific toll from traffic accidents caused by dangerous driving. Poorly maintained roads, drink-driving — despite a zero tolerance approach by police — and widespread corruption that allows the dishonest to purchase driving licences without taking a test, have been contributing to 30,000 deaths and 250,000 injuries on Russia’s roads each year. The Russian Association of Human Rights Lawyers plans to challenge what they called the “discriminatory” new law in the country’s Constitutional Court. “People who fall in those classifications are legally capable. It doesn’t affect their driving in any way,” said Maria Bast, a lawyer with the group, who came out as a transgender woman in 2013. Western critics regard the inclusion of sexual disorders in the list as another step towards marginalising sexual rights after Russia’s widely condemned adoption in 2013 of laws prohibiting the promotion of gay lifestyles to young people. Valery Evtushenko, of the Russian Psychiatric Association, said that some people would avoid seeking psychiatric help because they feared a driving ban. The law, he added, “may deter transgender people from seeking mental health services for fear of receiving a diagnosis that would strip them of their right to drive, [leaving] the door open for increased harassment, persecution, and discrimination of transgender people by the Russian authorities”. Alexandr Kotov, of Russia’s Professional Drivers’ Union, welcomed the move. “We have too many deaths on the road and toughening medical requirements is justified,” Mr Kotov said, although he felt that the requirements should be less strict for non- professional drivers. · Edward Snowden, the renegade US intelligence contractor, enjoys life in Russia, he told an American TV channel. “They talk about Russia like it’s the worst place on Earth. Russia’s great,” he told PBS yesterday. European Humanities University, ‘Public Conversation’ with Nick Holdsworth, April 2014. Photo: Dagmar Ouzoun, ETF country manager for Tajikistan with students, Aziza Islamova (l) and Farsona Alimova (r) at the Central Asian Regional Forum on School Development in Dushanbe, Tajikistan, on 25 September. The ETF opened the Central Asian Regional Forum on School Development in Dushanbe, Tajikistan, on 25 September. This three-day long conference with discussions and workshops gathers managers of vocational education institutions, practitioners, policy makers, teachers, and education experts from Kazakhstan, Kyrgyzstan, Tajikistan, Turkmenistan, Uzbekistan, and the European Union. Two teenage students from Dushanbe’s Railway Machinist Lyceum reminded delegates at the conferencewhat vocational education is all about. “As a child you dream of what you will become,” 17-year-old Farsona Alimova told teachers, policymakers and educationalists at a regional forum on school development for lifelong learning in Central Asia. Those dreams may change, the first year student of accountancy said, but a vision of the future remains. Fellow student Aziza Islamova, encouraged by Vincent McBride, the ETF’s senior human capital development specialist, to “be open – you are among friends here,” told of her wish that policymakers and college heads could understand and take into account the needs of young people. The students’ contribution – rarely heard at international events focused on vocational education and training – came on the first day of the conference that brings together the coordinators of the ETF’s innovative Communities of Practice (CoPs) programme from Tajikistan, Kyrgyzstan and Kazakhstan. Introduced two years ago, CoPs is a system that facilitates regular informal meetings of VET colleagues to discuss and review their professional and institutional practices and see how they can improve them. By focusing discussions on partnerships, school planning, analysis of local conditions, training of trainers, school leadership and teaching and learning, it is hoped that management reforms can be made more effective. The scheme, part of a capacity building and policy dialogue initiative in VET and lifelong learning launched in 2009, also includes dialogue with policymakers. Emin Sanginov, first deputy minister at Tajikistan’s Ministry of Labour, Migration and Employment, acknowledged the need to continue to improve quality in a VET landscape still recovering from years of post-Soviet neglect. Recent research showed that 80 percent of Tajikistan secondary school leavers go straight onto the labour market without following any further or higher education. The need to address the lack of skills in adult workers has prompted a drive to expand provision for lifelong learning and private sector incentives to encourage employer involvement in social partnerships with educational institutions, he said. “Improving quality in vocational education and training is key to Tajikistan’s social and economic wellbeing,” Sanginov said. In a region where “the majority of the population is under 30,” it was an EU priority to support the improvement of educational services, he added. NOVO OGAREVO, July 08. /ITAR-TASS/. Russia’s President Vladimir Putin has officially launched modernization of the Baikal-Amur Mainline (BAM) and the Trans-Siberian Railway, as he had a televised linkup on Tuesday with the officials, business executives and railway workers gathering in the city of Tynda, the Far-Eastern Amur region, in connection with the 40th anniversary since the start of the BAM project. The president congratulated the railway workers of the BAM on the occasion of the 40th anniversary and inaugurated the ceremony of laying a silver rail joint — section of the rails symbolizing the launch of construction of a new railway line. The project envisages a higher throughput capacity of the Baikal-Amur Mainline from current 16 to 32 railway vehicles daily by 2017. The growing transit potential would give an impetus to development of new raw materials, shoring up the economy of the Far East, Putin said, adding that Russia should preserve its status as “a major transport power, working with which is easy, comfortable and advantageous for partners”. BAM is one of the longest railway lines in the world. Together with the world-famous Trans-Siberian Railroad, it ensures transport access to the Pacific. The idea of building this railroad emerged at the end of the 19th century, but its practical implementation started during the Soviet era, at the end of the 1930s, when separate sections of the new line were built. Full-scale construction works began in 1974, with thousands of young college graduates and workers from all over the USSR coming to different places along the route of the future line. Ten years after the start of construction, BAM became an integrated railway line, but its construction continued. Its length from Taishet in the Irkutsk region to Sovietskaya Gavan, a port city on the Sea of Japan, reaches 4,300 km. It stretches across vast swathes of permafrost, down to 300m deep in some places, and the zones where seismic activity can be as high as 9.0 points on the Richter scale. BAM crosses eleven full-flowing rivers and seven mountain ranges, and the total length of its tunnels exceeds 30 km. A year ago, President Putin issued an instruction to the cabinet to draft a model plan for further steps towards modernization of the BAM and Transsib. The modernization project will require 562 billion rubles (around $ 16.3 billion) through 2018. Almost $4.5 billion have been allocated from the National Wealth Fund. Oleg Sentsov’s attorneys wrote a letter to the European Court of Human Rights claiming their client was poorly treated by security personnel and denied access to lawyers after his arrest on terrorism charges. KARLOVY VARY — Lawyers acting for Oleg Sentsov, the jailed Ukrainian filmmaker, say Russia breached the European Convention on Human Rights, of which it is a member, by arresting Sentsov on terrorism charges. In a letter to the European Court of Human Rights in Strasbourg, Yonko Grozev writes that his client’s arrest in Crimea and rendition to Moscow by Russian security agents breaches a number of key articles in the convention. Sentsov was “ill-treated by security personnel for three hours, in an effort to make him confess to the charges against him,” following his arrest May 10 in Simferopol on terrorism charges, the letter states. He was denied access to lawyers after his arrest in Crimea. And since his rendition to Russia, where he is being held in pre-trial detention at Moscow’s Lefortovo jail, his legal team has been threatened with criminal prosecution if they reveal any details of proceedings against their client and been denied access to prosecution documents relating to Sentsov’s arrest and detention. The letter is the first move in a process to lodge a formal complaint about Sentsov’s arrest and transfer to Moscow. The letter was sent Monday, the same day a Moscow court denied Sentsov bail. The court dismissed requests that house arrest could be substituted for bail, instead ordering that the filmmaker be held in prison until his trail, set to begin October 11. In a statement to the court, Sentsov denied he had ever been a member of Right Sector — a Ukrainian national group Russia says is behind violent attacks in Urkaine — or any other extremist group. Following Russia’s annexation of Crimea in March, Ukrainian citizens were automatically deemed by Moscow to have become Russian unless they left the region. Sentsov challenged that, telling the judge that he was a Ukrainian citizen and not a “slave” that could be transferred from one landowner to another and adding that he wished to return to his own country. 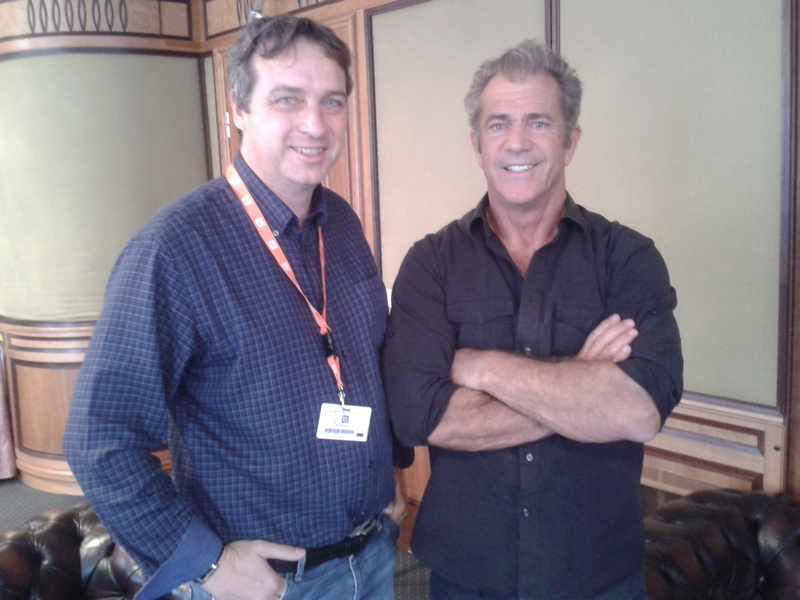 Mel Gibson – the post interview photo…. 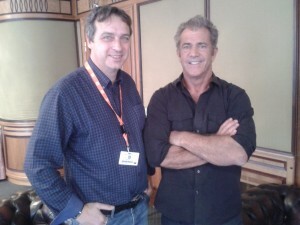 Mel Gibson at Karlovy Vary on July 4. The actor, at Karlovy Vary to pick up a lifetime achievement award, tells THR about his new projects. “I never did really have a master plan,” he says. Gary Oldman‘s recent controversial comments and references to Mel Gibson “biting the [Hollywood] hand that feeds him” may have revived the controversy over the actor and director’s 2006 anti-Semitic remarks, but for Gibson himself, the affair is long over and not up for discussion. Gibson, in Karlovy Vary to pick up the festival’s Crystal Globe for Lifetime Achievement, instead spoke with The Hollywood Reporter about his new projects and why he won’t finance any more of his films. THR: Oldman revived discussion of your controversial comments and often strained relationship with Hollywood. Do you think you’ve resolved those issues? MG: It’s behind me; it’s an 8-year-old story. It keeps coming up like a rerun, but I’ve dealt with it and I’ve dealt with it responsibly and I’ve worked on myself for anything I am culpable for. All the necessary mea culpas have been made copious times, so for this question to keep coming up, it’s kind of like … I’m sorry they feel that way, but I’ve done what I need to do. THR: You’ve played a wide range of roles as an actor and made movies as a director with difficult themes, like Apocalypto and The Passion of the Christ. What do you want to do now? MG: Its tricky, those films you refer to, nobody would have financed them, they more or less worked, but I would never have got anyone else to finance them. I’m out of that business of financing my own films because they see you coming and take you for a ride. I’m not a fool. It’s difficult for the things I deem worthy to direct, where you can get a really good compelling story out of — nobody else has much faith in it and never did. THR: Is there anything specific you can talk about now? MG: There are specific things, but I don’t want to talk about them, you know why? Because every time I do somebody else goes and does it. It’s a kind of industrial espionage thing and they do it badly for TV. THR: What roles are looking to play? MG: Nothing specific, but I’ve just finished a film in New Mexico, called Blood Father directed by Jean-Francois Richet, a very nice, good French film director and the theme for him is very Americana. I play this motorcycle guy who happens to have a daughter, who happens to be in trouble … and an adventure ensues. THR: Do films that explore such relationships interest you? MG: It varies … I never did really have a master plan. I just do what’s in front of me and what interests me at the time. There are ideas everywhere and they come literally from everywhere and that’s good. But there are no new ideas, ever. The only thing you can do that is different is to execute the idea differently. Fyodor Bondarchuk, (left) director of “Stalingrad”, on set in a production still. The filmmaker’s WWII epic “Stalingrad” grossed $66 million last year, the strongest performance ever by a Russian film. MOSCOW — Fyodor Bondarchuk, director of Russia’s highest grossing movie ever, Stalingrad, has been tapped to shoot his first Hollywood movie. Bondarchuk has been hired by Warner Bros. to direct Odysseus, an epic adventure based on Homer’s poem of the return of a Greek king after the Trojan war. The movie, scripted by Jeremy Doner, is being producer by Gianni Nunnari (who produced Zack Snyder‘s 2006 epic of the battle of Thermopylae, 300) and Moscow-based producers Paul Heth and Michael Schlicht. Bondarchuk’s all-action visual effects-rich 3D take on the WWII clash between Hitler’s forces and the Red Army, grossed more than $66 million on a budget of $30 million. The film’s success in the Chinese market, where it took $11 million is believed to be among the reasons Warner Bros. was keen on the director. Bondarchuk is the first Russian director to cross over to Hollywood since Timur Bekmanbetov was hired in 2008 by Universal to direct Wanted, starring Angelina Jolie and James McAvoy. Bondarchuk confirmed Wednesday to The Hollywood Reporter that he had been hired but declined to offer more details on location, cast or production schedule. Sad news to report about a friend and colleague: Eva Vezer, former head of Hungarian film promo body Filmunio, who passed away last Friday.